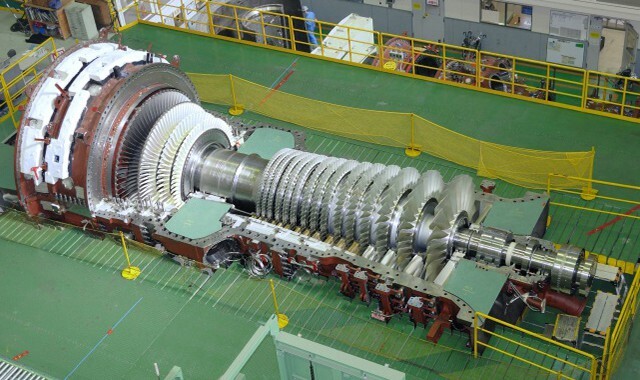 The gas turbine is the engine at the heart of the power plant that produces electric current. A gas turbine is a combustion engine that can convert natural gas or other liquid fuels to mechanical energy. This energy then drives a generator that produces electrical energy. It is electrical energy that moves along power lines to homes and businesses. Fast Fact: The GE 7F.05 gas turbine generates 225 MW, equivalent to 644,000 horsepower, or the power of 644 Formula One cars. To generate electricity, the gas turbine heats a mixture of air and fuel at very high temperatures, causing the turbine blades to spin. The spinning turbine drives a generator that converts the energy into electricity. The gas turbine can be used in combination with a steam turbine—in a combined-cycle power plant—to create power extremely efficiently. The gas turbine compresses air and mixes it with fuel that is then burned at extremely high temperatures, creating a hot gas. Hot gas spins turbine blades. The hot air-and-fuel mixture moves through blades in the turbine, causing them to spin quickly. Spinning blades turn the drive shaft. The fast-spinning turbine blades rotate the turbine drive shaft. Turbine rotation powers the generator. The spinning turbine is connected to the rod in a generator that turns a large magnet surrounded by coils of copper wire. Generator magnet causes electrons to move and creates electricity. The fast-revolving generator magnet creates a powerful magnetic field that lines up the electrons around the copper coils and causes them to move. The movement of these electrons through a wire is electricity.